The latest gaze into the crystal ball shows February 20th as the launch date for the Samsung Galaxy S10. 9to5google.com reports that the flat 5.8 inch screen S10 will run $1117 with 128 Gigs of storage. The standard S10 will come with 128 or 512 Gigs and they rill run $1334 and $1668 respectively. Oh…and if you go for the 1TB model, that one will be a wallet crushing $1750! 9to5google.com notes these probably aren’t the final US prices, but if they are, it appears that those tariffs are really taking a toll on consumer electronics! All the time Amazon was playing cities off against each other for it’s HQ2…which turned out to be a couple of satellite HQs, Apple was looking in stealth mode. According to engadget.com, Apple will invest a billion dollars in a new campus in Austin, TX less than a mile from its existing facilities there. The 133 acre site will house 5,000 employees, with room to grow to 15,000. This would make Apple the biggest employer in Austin! They also plan to build out new sites in Seattle, San Diego, and Culver City, CA, and expand in Pittsburg, New York, and Boulder, CO over the next 3 years! The new Austin site will have engineering, R&D, operations, finance, sales, and customer support…and as with all Apple facilities it will be powered by 100% renewable energy! News item: VitiminWater will pay you $100,000 to give up your smartphone for a full year. The fancy water purveyor will allow you to utilize a 2000s ear feature phone, however. To enter the contest, you have to post a photo to your Twitter or Instagram account, tag VitiminWater, and tell them why you need a break from your smartphone. You also have to tell them what you will do to survive or pass the time over that period of a year. Now, if Apple would just pay me $100,000 to give up VitiminWater, I’d be counting the money right now! It’s looking more and more like the Samsung Galaxy S10 will be s pretty significant update. According to businessinsider.com, there will be 3 models (like a certain company out of Cupertino), ranging from 5.8 to 6.1 to 6.4 inch display sizes. One will be a less expensive model without the curved edges Samsung has favored of late. One model may support 5G networking. A big rumor has a front facing fingerprint scanner under the display, and the phones may have something like Face ID…at least on the two higher end models. A big leapfrogging over Apple….3 rear cams may come on at least two models, and two front facing cams. The 3rd back lens will be a 16MP ultra wide angle lens. Expect the S10’s in March…no pricing leak so far. The two top phones will have ‘almost no bezel, and the front cam may be hidden under the display…no notch? Here’s an innovation if it pans out…no earpiece. The audio will be transmitted to your ear with vibrations emanating from the display! Tomorrow…Tuesday…we are expecting freshened iPads and a replacement to the MacBook Air from Apple. Stealing from Ron Popeil of Ronco fame—’but wait…there’s more!’ We will probably see iOS 12.1 released after the show, and it will include the eSim launch for the iPhone Xs, Xs Max, and XR. 9to5mac.com reports that you will be able to add a 2nd phone line to your existing iPhone for calls and texts, and even can use different data plans on each number. The handset will answer calls from both numbers automatically. The service should be available from carriers in the US, Europe, and India. You should be able to sign up through Apple stores or some carrier apps. That’s just for the latest iPhone users…how about everyone else in the iPhone world? There are 70 new emoji coming, too! Also in 12.1…the ability to adjust the bokeh blur in Portrait mode before shooting the pic. IBM…Big Blue…has not had the best time of it the last few years. Now, with the acquisition of Red Hat for $34 billion, they may have bought themselves a lifeline. Techcrunch.com notes that IBM is saying that the addition will be a game changer, as it will make IBM the number one hybrid cloud provider, since Red Hat is the top supplier of Linux open source software. Linux has been successful in running big data workloads and AI workloads, which will assist IBM in expanding its healthcare software business particularly. types like Richard Spencer and KKK’s David Duke. The Samsung Galaxy S9 hasn’t set any records so far…in fact, it’s the slowest selling Galaxy S phone series since 2012. That may be changing, though. Bgr.com says a new leak points to as any as 4 Galaxy S10 models! All will be powered by 7 nanometer chips like the new iPhones. It appears all will also be ‘full screen’ designs, again like Apple’s phones. On top of that, besting Apple at least this time around, there will be at least one with a triple-lens camera…AND a dual lens front selfie cam, too! The phones should rock an ultrasonic fingerprint sensor…it will live behind the display, so no fooling around to find the sensor on the back. There will be a new Chapter model, with slightly less dramatic specs, plus the main phone…with a 5.8 inch super AMOLED display, a bigger one with a 6.44 inch screen, and the 5 cameras, finally…a 5G model! We may see all of these, plus the long-rumored folding Samsung shoe at CES in Las Vegas this coming January. Thanks to China’s Ministry of Industry, we now know the memory size of the new iPhones and their battery size. Macrumors.com reports that both the new iPhone Xs and Xs Max have 4 Gigs of RAM…the upcoming XR has 3 Gigs. The Xs Max sports the biggest battery ever in an Apple handset…3174 mAh, while the XR will have 2942 mAh. The Xs loses battery capacity compared to the X, going from 2716 down to 2658 mAh, a drop of 2.2%. Apple touts 90 more minutes of use time from the Xs Max over the old X, but several early testers say they are doing noticeably better than that. Apple is far from alone when it comes to wearables getting into the health market…Fitbit has launched Fitbit Care, a service that will coat on staying well…whether it comes to slogging through your fitness plan or managing diseases. According to theverge.com, the service is a premium product designed for health care customers or employers and health systems that use Fitbit to keep tabs on employee health (and keep costs down.) There’s a new app (of course) called Fitbit Plus. It processes data from your Fitbit and other medical devices like blood pressure monitors. The app also features a social platform. First users are those with health insurance from Humana, which already provides customers with Fitbits. We will probably see a number of other companies dive in now that both Apple’s Watch and Fitbit devices have embraced health whole hog…or maybe that’s half-hog….or vegan, artificial hog. Grab your credit card, and swallow hard…Sony’s revamped Aibo robot dog is up for pre-order in the US. Engadget.com says the adorable pup for early adapters, robot fans, and dog lovers that are allergic to actual pets ships mid-December. 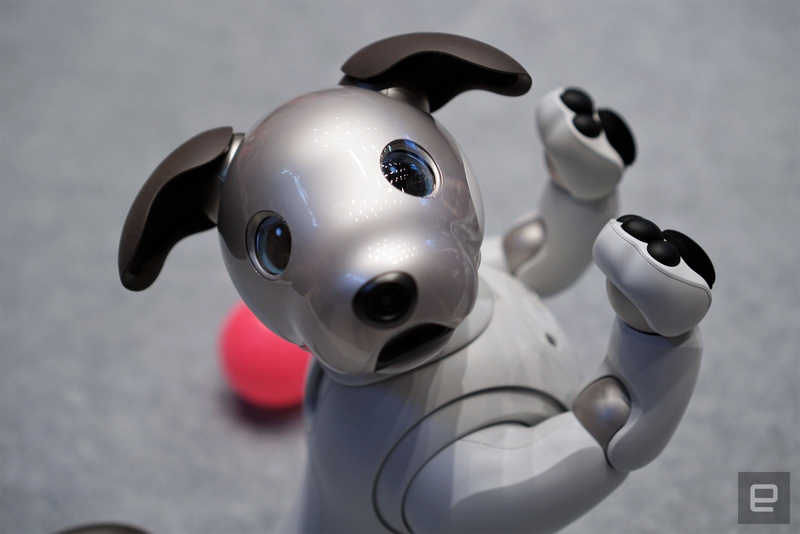 You’ll get Aibo, an ‘aibone,’ a pink ball, paw pads, and 3 years of AI cloud service…all for the small fee of (gulp) $2900! That’s more than a couple vet visits and a year’s supply of dog food for most! If you have the nearly 3 grand to throw down, hurry…it’s a limited edition! The Galaxy Note 9 bows in just a couple weeks, but meanwhile, we have more word on a possible killer feature for next year’s Galaxy S10. No, it’s not the foldable phone! Bgr.com says the fingerprint reader we’ve heard that would be under the screen on the Galaxy S10 will be something no one has had before. For the 10th anniversary of the iPhone competing smartphone, Samsung will use an under screen, ULTRASONIC fingerprint reader! The ultrasound fingerprint reader is supposed to have better performance than an optical sensor, and should give Samsung to tout against Apple’s Face ID. It sounds like both the two Galaxy S10’s will have this feature, as will next year’s high end Galaxy A and the 2019 Galaxy Note. After disappointing 2nd quarter earnings were reported yesterday, Facebook stock went off a cliff. Businessinsider.com reports that the stock dropped enough to be on pace to lose $115 billion in market value…which would be the biggest collapse in market history. Facebook reported earnings after hours Wednesday, and dropped 24% in an hour. Investors didn’t like sales and subscriber numbers that were lower than expected, but really hated the warning of a growth slowdown. Investors also pounded other monster cap companies in tech…Apple, Amazon, Netflix, and Alphabet all lost more than 1.5% overnight. A positive note for Facebook…at least theoretically…lies in the acquisition of Redkix, and email startup that combines email, messaging, and calendar features into one app. According to recode.net, Facebook intends to roll the app into Workplace, their enterprise social network platform. Facebook and about 30,000 other companies have their employees using Workplace internally for messaging and groups. Facebook hasn’t shared how many of these are paying customers, nor has it broken out Workplace revenue on earnings reports, so it’s hard to tell if the subscription model is working for them. After a brutal legal battle, it looks like Apple will be going with all Intel Modems, and dropping Qualcomm. Appleinsider says the Qualcomm CFO noted in a conference call that Apple will be using only Intel modems in the upcoming iPhones. Intel has only been supplying Apple modems since 2016. Besides the legal battle between Apple and Qualcomm, the Intel modem chip runs on both GSM and CDMA networks, so has that big advantage. Losing Apple…even if only for a year…would be a big hit to Qualcomm’s earnings. The Galaxy S8 and the new S9’s have face unlock, but it’s 2D, not 3D. Now, according to 9to5google.com, Samsung is working on a true 3D system like Apple’s iPhone X on the S10. If the trials pan out, you may not need to combine the face unlock with either a fingerprint or iris reader to access things like your bank and credit accounts when the S10 comes out next year. The Samsung Galaxy S9 and S9+ are out tomorrow, and have a heart rate sensor on the back. That’s nothing new for Samsung, but this one has an added trick that never got covered in all the leaks or even the rollout. Bgr.com says Samsung has managed to fly a feature of it under the radar. In February, at the rollout, Samsung also announced an app called My BP Lab. The app transforms the Galaxy S9’s heart rate monitor into a blood pressure monitor. Preliminary tests by journalists that have tried it out indicate that the readings are extremely accurate! Right now, the feature is a bit of a beta, and isn’t incorporated into the main Samsung Health app, but it likely will be before long. Nest has rolled out a temperature sensor that works with its smart thermostats to keep rooms in your home closer to the ideal temperature. Theverge.com reports that the #39 sensor will be shipping in April, and there’s a preorder now for a 3 pack for $99. It does require the latest-generation Nest Learning Thermostat or the Thermostat E, and won’t work with first or second generation Nests…so I’m out of luck for now. Nest has also released the Hello video doorbell for $229, and the long time coming Nest x Yale door lock…which is $249 or $279 if you get Nest Connect. The video doorbell does require a wired connection with power, but it is a direct shot at the Amazon Ring from Google. Apple has applied for a patent on a ‘keyless keyboard,’ one that would basically use another touchscreen with haptic feedback to allow for a more versatile (and liquid and crumb-proof) keyboard. Appleinsider says it would allow for moving the trackpad into the middle, or changing the layout of the keyboard to an ergonomic one, and even specialty keyboard layouts using just software. As will all patents, and especially Apple’s, there’s no telling when or if this might hit the market.